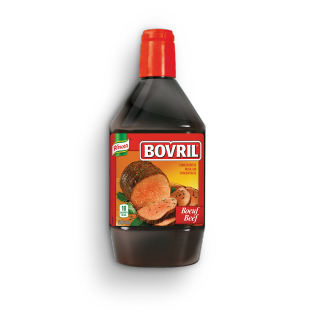 Knorr Bovril Liquid Beef Bouillon adds great flavour to your cooking. It can be added to broths or added directly to food as a seasoning. Knorr Bovril liquid bouillon is easy to use, quick to dissolve and adds rich deep flavour to your soups, stews, sauces, rice, vegetables, proteins and potatoes. Water, hydrolyzed soy/corn/wheat protein, salt, monosodium glutamate, colour, autolyzed yeast extract, modified corn starch, sugar, beef extract, maltodextrin, spices, dimethylpolysiloxane, celery seed and sulphites. May contain traces of milk ingredients. For broth: add 2 tsp (10 mL) to 1 cup (250 mL) boiling water. For seasoning: add directly to foods.